When we talk about a gaming rig, one of the main issues that the common gamer faces is cable management. There are so many wires and components involved that setting up a clean build can be a problem. The mouse cable is one of the things that can be a part of this problem. You would think that moving to a wireless solution would be the ultimate answer here but wired mice are actually better when it comes to gaming. Input lag is the enemy in this case and nothing beat input lag like a wired connection. So, a wireless mouse solution is out of the question. In order to deal with the mouse cable, you can get a mouse bungee. Here we are going to look into some of the best mouse bungees on the market that we can recommend. 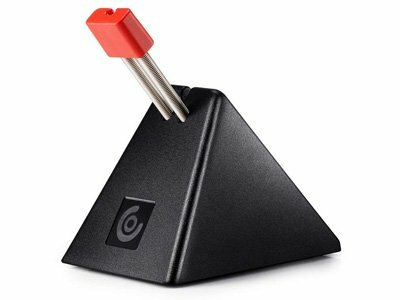 Why You Need a Mouse Bungee? The Razer Mouse Bungee tops our list for being the best mouse bungee as it is the most popular option on the market right now. It has got a brilliant cable management design for smooth and perfect mouse moving experience. The bungee keeps the cord of the mouse off the surface, this prevents tangles in the mouse cable. For stability, there is a weight installed in the center of the base along with anti-slip rubber feet which keeps the bungee in place. The Razer Mouse Bungee provides comfort by managing the cord of your mouse. It keeps the cord off the desk and reduces drag. Razer is known for making high-quality gaming peripherals and accessories. If you want the best of the best then Razer can provide you with that. The mouse bungee keeps the cord of the mouse off the ground when you thread it through a spring arm. This prevents tangles in the mouse cable. 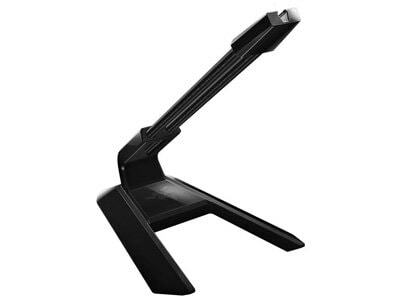 For stability, there is a weight installed in the center of the base along with anti-sleep feet on the underneath which means that Razer bungee will remain stable no matter what the situation is. The mouse bungee is specially designed to look more aesthetic and to add more fashion and class into your gaming rig with a sleek and unique design. There are anti-slip feet available for heavy-duty stability so that you won’t face any issues while dragging the mouse from one place to another. The Razer mouse bungee is space-saving and it helps you to keep a lot of space spare. It has also got a drag-free cord control. All things considered, here is what you need to know about the Razer Mouse Bungee. The cord of Logitech G502 doesn't fit for our testing. Aketek has another versatile mouse bungee which allows you to have a drag-free control of the mouse. The wire clip can easily be adjusted according to your preference. The bungee works perfectly with any wired mouse. The mouse bungee is perfect for playing games like Counter-Strike. The Aketek mouse bungee provides is great for cable management and reducing drag. If you need a mouse bungee but do not want to spend too much money then this is a reasonable option to consider, keeping in mind what you are getting for the price. This mouse cord management system gets hold of the long winding wires of your mouse and keeps the cord off the ground whenever you adjust it on the system. The drag-free control allows you to move the mouse anywhere without any issue. The wire clip part of this mouse bungee can easily be adjusted according to the requirement of angle. You can also adjust it according to your needs. The mouse bungee works perfect with any wired mouse and it will give a feel just like you are using a wireless mouse. The mouse bungee is perfect for playing games like Overwatch and Counter-Strike. It will never allow the cable to interfere with the mouse in any way. Here is the pros & cons that you need to know about the Aketek mouse bungee. If you are looking for an aesthetic gaming bungee then this is another great option for you to look into. The bungee comes with a rubber anti-slip coating that keeps it planted in place. Assembly is easy and the bungee will reduce drag when gaming. The Thermaltake Gaming Mouse Bungee is an elegant cable management solution for wired mice. If you want a bungee that is not only functional but looks good as well then this is an option worth considering. The mouse bungee has got a magnetic design. The magnetic design keeps the head of the bungee in place for stability and for keeping the cord off the ground. The rubber coating available on the bottom makes it a non-slip mouse bungee. It will get stuck to PC table with ease and convenience. The mouse bungee is capable of adjusting almost all gaming mice cords for a drag-free mouse moving experience. The bungee is easy to assemble and it is highly effective at the same time. The aesthetic and stylish design adds more attraction and gorgeousness to your gaming rig. Here is what you need to know about the Thermaltake gaming mouse bungee. The CASETHRONE gaming mouse bungee is popular with gamers from all across the world for its cable management and protection. The mouse bungee will reduce drag when gaming and keep the mouse cord from getting tangled. The use of ABS, silicone and stainless steel ensures durability. 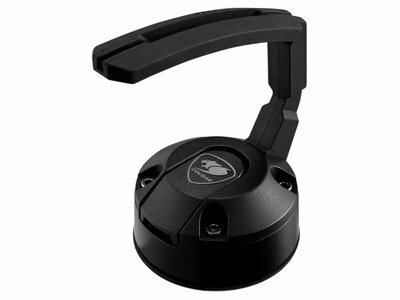 CASETHRONE mouse bungee is great for cable management and for reducing drag when gaming. If that is something that you need then you should pick one up. The mouse bungee is able to make your cord off the desk and away from any kind of mess respectively. The bungee will assist you a lot while you have got full concentration on the games you are playing by keeping the cord interference away from the mouse. The heavy duty design makes it stable and anti-slip at the same time. The control provided by the mouse bungee is drag-free which allows you to have a better gaming experience. The use of ABS, silicone and stainless steel materials in this bungee ensures that it can work out for a longer span. Here is everything that you need to know about the CASETHRONE gaming bungee. The arm of the bungee is made up of flexible silicone and can hold braided and non-braided mice cables while reducing drag. It also offers four 2.0 USB input ports. Which means that you can connect different devices and manage cables more effectively. The LED lights add character to your build. There are three rubber non-slip pads to keep the bungee in place. It also comes with a 3-year warranty. ENHANCE LED Gaming Mouse Bungee comes with LED lights, a silicone arm, drag-free control and USB ports. If you want all that at a reasonable price then this is an option worth looking into. The arm of the bungee is made up of flexible silicone material. the arm is capable of holding the braided and non-braided mice cables with a drag-free control. The mouse bungee has got a 4 port USB hubs. 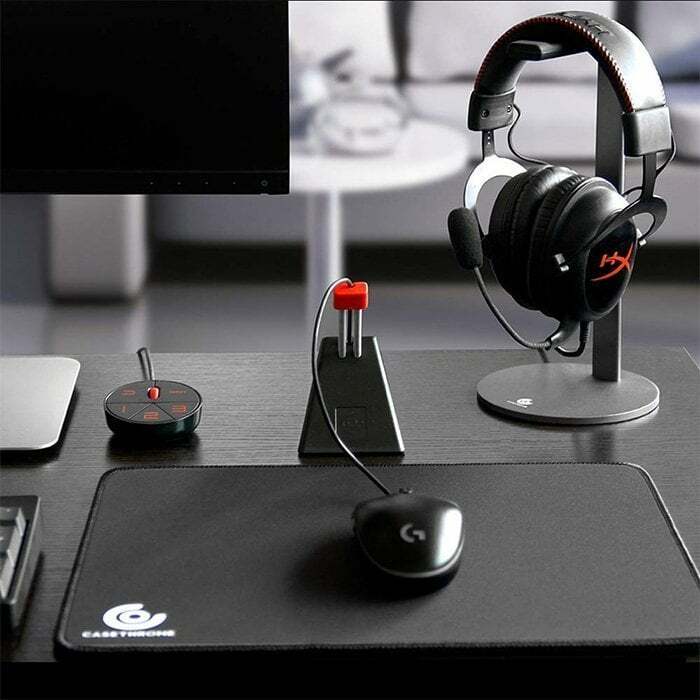 With the help of four 2.0 USB input ports, you can connect the mouse, keyboard, and other gaming accessories with it easily. The gaming mouse bungee has got impressive LED lights which adds more style to your gaming rig. The three rubberized non-slip pads help the bungee to remain intact on the position where it is placed. Last but not least, this mouse bungee comes up with 3 years warranty so that you can buy the product with confidence. Here is what you need to know about this mouse bungee. This Cougar mouse bungee uses a patented vacuum design and that’s why it is one of the sturdiest bungees available 20 bucks. The rubber arm is flexible and durable. The Cougar CGR-XXNB-MB1 is one of the most compact gaming mouse bungees which provides rigid stability with its advanced suction mechanism. The mouse bungee is capable of keeping the cord under total control. You will never face any disturbance after you place the cord in this bungee’s arm. The powerful Vacuum patented design that works on suction cup mechanism keeps the mouse bungee steady at all the times without any issues. The base is ultra-compact. It requires very less space on a PC table as well. The raised rubber arm of the bungee is flexible which adds more to its durability. Last but not least, the bungee has got a lightweight design. You can take this management device to any eSports tournament you like. All things considered, here is everything that you need to know about the Cougar mouse bungee. This mouse bungee features a silicone arm which is used to hold the cord off the desk for better accuracy and to reduce drag. Three rubber non-slip pads keep the bungee in place. There are 4 USB ports which allow you to connect other gaming accessories to the bungee. It also comes with ambient LED lights. The compact sized design will not take up much space on your gaming table. NPET provides one of the best mouse bungees at a very reasonable price. You should consider one of these if you are in the market for a new mouse bungee. This mouse bungee features a silicone arm which is used to hold the cord off the ground for better accuracy and to avoid the winding issues. With the help of three rubberized non-slip pads, it will remain intact to the table no matter what the situation is. There are 4 USB input ports available which allow you to connect other gaming accessories like keyboards, mice and USB cable etc. with the bungee easily. The mouse bungee has got ambient LED accents which looks quite gorgeous in combination with a similar gaming rig. The compact sized design will not take much space on your gaming table respectively. Here is what you need to know about the NPET gaming mouse bungee. A bungee is an important component of your setup especially when you have got a wired gaming mouse. We have reviewed some of the best mouse bungees that are available on the market. If you are still confused, our recommendation will be to go with the Razer Mouse Bungee. Getting a mouse bungee is not a major concern for gamers. People do not usually get them because they do not see the added value. This is something that you need to experience in order to feel the difference. Another mistake that people make is that they pick up the cheapest option that they can find on the market. This is not something that we can recommend. If you are in the market for a new mouse bungee then there are a couple of things that you need to keep in mind. A good mouse bungee is a necessity of almost every gamer who has got a wired mouse. With the help of this device, you can easily play games without the disturbance of the mouse cord. Mouse bungees also add an attractive look to your gaming rig as some of them come with LED lights. Make sure that the mouse bungee that you are buying has got non-slip feet. This will ensure that the bungee stays in place and does not fly across the room. The arm is the most important component of a gaming mouse bungee because that’s the part which holds mouse cord. You need to get a bungee that has a flexible arm. Bungees offer additional features as well. Some come with LED lights and others offer USB ports. Pick the bungee that has the features that you need. A mouse bungee shouldn’t come with a hefty price range. Their prices should only go as high as 20 to 25 dollars. So, the money would not be an issue for you. Still, if you don’t want to invest a huge sum of money on mouse bungee, you can buy a cheap budget one that has got good features to offer. Mouse bungees these days are also available with around two to four USB inputs for a better connectivity. You can connect your mouse, keyboard, charge cell phone and can do other things also with the help of these USB inputs. So, if you are serious about choosing a cool featured mouse bungee, we will recommend you to go for the ones with extra USB ports. We hope that you would have got enough knowledge about a gaming bungee and how it works. After this complete buyer’s guide, we expect that you can choose one from the above-mentioned list.